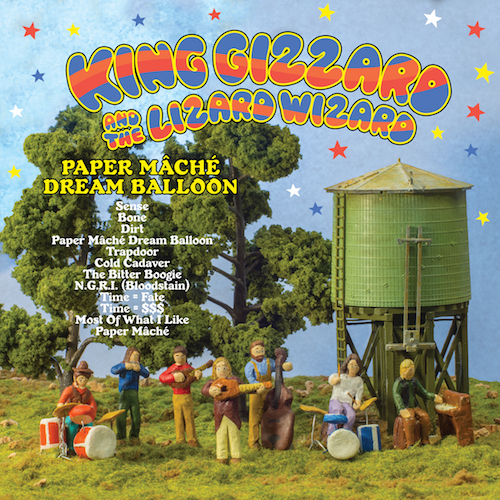 King Gizzard & The Lizard Wizard – ‘Paper Mâché Dream Balloon’ – Can You Get to That? This is the title track from Gizz’s upcoming 7th album which according to frontman Stu Mackenzie will feature zero electric instruments, and shorter, generally unrelated songs, in stark contrast to the band’s preceding albums Quarters! (2015) and I’m In Your Mind Fuzz (2014), which were both concept records packed with long, jammy songs. ‘Paper Mâché Dream Balloon’ is perhaps the closest to Summer Of Love-era sunshine pop that Gizzard have come so far; it’s even more than a little bit reminiscent of their Flightless label-mates The Babe Rainbow, with the addition of Mackenzie’s unmistakeable flute lines that have similarly dotted the band’s last few releases. The slightly demented artwork for the upcoming album suggests that the rest of what it already seems will be quite a folky, pastoral effort (hey, Beard, Wives, Denim) might well be a fairly authentic trip back to the 60s, which is something Gizzard haven’t really done yet either; to me Float Along (2013) always felt more like a mix of Thee Oh Sees and The Brian Jonestown Massacre than an intensive stay in a commune via Haight-Asbury.